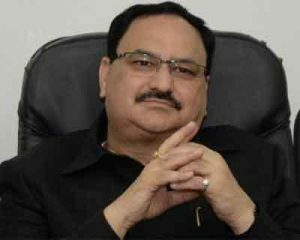 An unidentified person threw ink at Union Health Minister J P Nadda at All India Institute of Medical Sciences (AIIMS), Bhopal, amid protest by students over poor facilities at the institute. Ink was thrown at the Minister at the entrance of the AIIMS when he was in his car leaving the institute, surrounded by protesting students amid and rains and chaos. Few drops of ink fell on the Minister’s kurta. An official of AIIMS Bhopal, on the condition of anonymity, said it is so far not known who threw the ink. He said the police have started investigating the matter. Students had gathered to lodge protest over poor facilities at the AIIMS when Nadda was at the premier medical college to dedicate a number of facilities. A third year MBBS student Rishi Prem claimed two of the protesting students, Ijya Pandey and Anjali Krishna, sustained injuries as the Minister’s vehicle made a forced exit. “No student of AIIMS college threw ink at Nadda. We protested silently against lack of infrastructure at AIIMS where no surgery has taken place yet,” Prem, a student who hails from Kerala, claimed. “We just wanted to talk to the Minister for improving AIIMS. We don’t have even minimum facilities at the institute required for treating patients and learning. There is no permanent director at AIIMS,” Prem added. Director, AIIMS-Raipur, who is also acting in-charge of the Bhopal facility, Dr Nitin Nagarkar, was not available for comments despite repeated calls. The AIIMS source declined to comment on the condition of the two students who were injured.